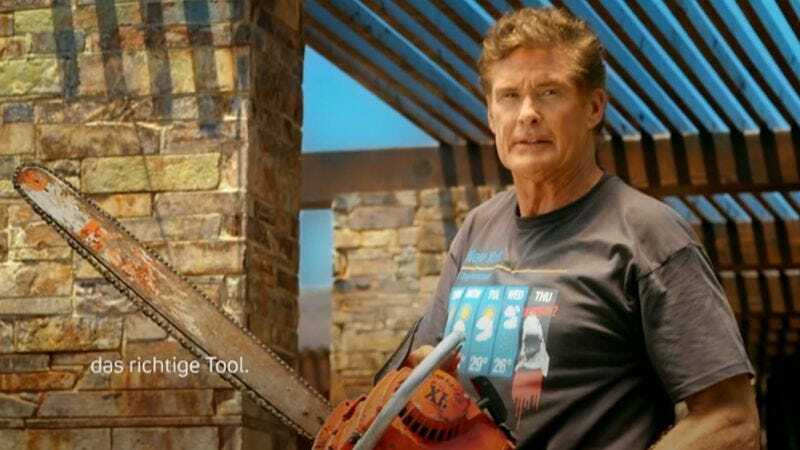 The Sharknado movie series—in which once-popular TV stars engage in self-aware kitsch in the hope of becoming Internet memes, leaving a sloppy trail of destruction in their wake—will now be joined by the human version of that, David Hasselhoff. The Wrap reports that the former Knight Rider and Baywatch star has been cast in Sharknado 3 as Ian Ziering’s dad, presumably a guy who makes winking reference to the shows Knight Rider and Baywatch, in the sequel that will add some much needed character-shading to Syfy’s 90-minute long hashtag prompt. Hasselhoff’s character’s name is “Gil.” Ziering’s character is called “Fin.” These are references to fish. Sharks are fish. These are the jokes. As previously and increasingly grudgingly reported, Sharknado will continue its transition into The Surreal Life But With Sharks by adding even more celebrities who are looking for easy Google alerts, with Hasselhoff joining Bo Derek, Jerry Springer, Chris Jericho, Mark Cuban, Ann Coulter, and *NSYNC’s Chris Kirkpatrick in being crushed by tornado-driven sharks—a gig that is still more dignified than Dancing With The Stars. For Hasselhoff, it’s the realization of a dream that began last year, when he starred in a preview for Sharknado 2: The Second One that aired exclusively for Hasselhoff’s adoring German public. Like Syfy and David Hasselhoff, the Germans are noted for their excellent sense of humor. The addition of Hasselhoff to the cast hints at a new direction for the inevitable Sharknado 4, in which Hasselhoff wreaks havoc across the Eastern seaboard by trying to eat a hamburger.